Today, the Delray Beach Open by VITACOST.com announced that world No. 9 ATP player and top American John Isner has received a wildcard for this year’s singles event. Making his return to Delray on Tuesday, February 19th in the afternoon session, Isner is a three-time semifinalist in Delray Beach and will be making his seventh main draw appearance with a 10-6 career record. This will also be the fifth time Isner is seeded in the top 2 in Delray Beach (2014, 2015) and was previously the top seed in 2012 and 2013. In 2018, Isner won the biggest title of his career at the Miami Open Masters 1000 and has won 14 total career titles. Reaching a career high singles ranking of No. 8 in July 2018, Isner is the tallest top ten player in history and has won 30+ matches and finished 9 straight seasons ranked in the top 20. Additionally, Isner has also reached the semifinals of Wimbledon, the quarterfinals of the US Open twice, and the Round of 16 three times at Roland Garros. Isner is known around the world for winning the longest match in tennis history in the first round of Wimbledon in 2010 defeating Nicholas Mahut 70-68 in the fifth set after 11 hour and five minutes of play over the course of three days. While Isner has confirmed his return to Delray Beach, top ten ATP player Kevin Anderson is withdrawing from the event due to an injury. This year’s player field in Delray Beach consists of a star-filled line-up including former US Open and Delray Beach Open Champion Juan Martin del Potro (World No. 4), Milos Raonic (World No. 14), ATP sensation Nick Kyrgios and 2018 Champion Frances Tiafoe who is coming off a hot run at the Australian Open where he reached the quarterfinals. Americans in the draw this year include Steve Johnson and Tennys Sandgren and rising young guns Mackenzie McDonald, Michael Mmoh, Taylor Fritz and Reilly Opelka. Bringing the international flair to the field are ATP favorites Andreas Seppi (Italy), Feliciano Lopez (Spain), Adrian Mannarino (France), Bernard Tomic (Australia), John Millman (Australia) and former champion Ivo Karlovic (Croatia). Making his fifth appearance and starting his season for the third consecutive year in Delray Beach this year, del Potro will play his first round match Tuesday, February 19th, at 8:00 p.m. following 2018 Singles Champion Frances Tiafoe at 6 p.m. in a blockbuster night of play. Scheduled to play Tuesday, February 19th, during the day session is Milos Raonic in addition to John Isner. In the doubles action, the Greatest Doubles of All-Time Bob and Mike Bryan will play their opening match Wednesday night, February 20th. Legends lined up to play the tournament’s opening weekend ATP Champions Tour event at the iconic venue include Tommy Haas (Captain), Tim Henman, Mikael Pernfors and Wayne Ferreira on Team World and Fernando Gonzalez (Captain), Jesse Levine, Jan-Michael Gambill and Jay Berger on Team Americas. Team Americas will be trying to end a two-year losing streak to the International squad. The 10-day 2019 Delray Beach Open by VITACOST.com will begin Presidents’ Day weekend (Friday, Feb. 15 – Sunday, Feb. 17) with the ATP Champions Tour legends team-event and ATP 250 qualifying tournament, continue with the ATP 250 singles and doubles main draws starting on Monday, Feb. 18 and conclude with the finals on Sunday, Feb. 24. Around the grounds, guests can also enjoy VIP fêtes, live music, top-shelf drinking and dining, family activities, and a local art scene. New this year, opening weekend will see the inaugural First Serve Tennis Ball and ATP Pro Am. The “Tennis Ball” on Saturday evening February 16 will feature a lavish dinner and open bar with live entertainment starting at 6:00 p.m. followed by box seats at the Team World vs. Team Americas ATP Champions Tour matches. On Sunday, February 17, the Pro Am tournament will swing underway at 9:30 a.m. with 12 teams comprised of an amateur and an ATP professional player competing against each other. The top two teams from the morning session will play against each other in the Pro Am championship match on Stadium Court between the day’s two scheduled ATP Champions Tour matches. The championship match will include a chair umpire, ball kids, Hawkeye Live electronic line-calling and all match amenities afforded ATP pros, as well as a raucous crowd. For “Tennis Ball” tickets or to participate in the ATP Pro Am, contact Sonny Maken at First Serve directly at Sonny@firstserveusa.org or at 561-767-0220. 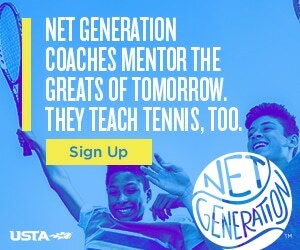 A complete schedule of all Delray Beach Open by VITACOST.com match times and ticket opportunities is posted at YellowTennisBall.com. Tickets can be secured online or by calling 561-330-6000. Disclaimer – Match schedule, including number of sessions, dates, times, number of matches and players scheduled are subject to change. Tickets are not eligible for refund or exchange. About The Delray Beach Open by VITACOST.com: The only tournament in the world featuring an ATP Champions Tour event and an ATP 250 event in the same week at the same venue is held in Delray Beach, Florida, February 15-24 at the Delray Beach Stadium & Tennis Center. The ATP Tour’s first North American hard court event of the outdoor season is one of just 10 ATP Tour events in the United States. 2019 will be its 21st year in Delray Beach, and 27th overall. The 3-day, ATP Champions Tour legends team-event is in its 10th year and was the first-ever event played on US soil. Each year the Delray Beach Open by VITACOST.com brings world-class tennis players and thousands of visitors to Delray Beach and Palm Beach County. In 2010, the tournament received the Discover The Palm Beaches Florida’s annual Providencia Award for its extraordinary contribution to tourism. The City of Delray Beach was also a finalist for the USTA’s “Best Tennis Town” Award and in 2003, the tournament was the recipient of an “ATP Award of Excellence.” For more information please visit www.YellowTennisBall.com. About VITACOST.com: Vitacost.com, Inc. is an online retailer of health and wellness products, providing an award-winning experience to customers through its website, www.vitacost.com. Vitacost.com features affordable pricing and speedy delivery on nearly 40,000 items, including dietary supplements (vitamins, minerals and herbs), hard-to-find specialty foods, organic body and personal care products, pet essentials and sports nutrition products. In addition, Vitacost.com strives to motivate, educate and inspire healthier living for customers by creating and curating thousands of helpful tips, expert articles and recipes. Vitacost.com is a subsidiary of The Kroger Co. For more information, please visit www.vitacost.com. About The ATP: The ATP is the governing body of the men’s professional tennis circuits – the ATP Tour, the ATP Challenger Tour and the ATP Champions Tour. With 63 tournaments in 30 countries, the ATP Tour showcases the finest male athletes competing in the world’s most exciting venues. From Australia to Europe and the Americas to Asia, the stars of the 2019 ATP Tour will battle for prestigious titles and ATP Rankings points at ATP Masters 1000, 500 and 250 events, as well as Grand Slams (non ATP events). At the end of the season only the world’s top 8 qualified singles players and doubles teams will qualify to compete for the last title of the season at the Nitto ATP Finals. Held at The O2 in London, the event will officially crown the 2019 ATP Tour No. 1. For more information, please visit www.ATPTour.com. About the ATP Champions Tour: The ATP Champions Tour brings together many of the greatest tennis players in history for nostalgic, competitive and entertaining tournaments around the world. Players are either formerly ranked No. 1 in the world in singles, a Grand Slam singles champion or finalist, or a singles player on a winning Davis Cup team. Players must be retired from ATP Tour competition and each event can invite wild card entrants of its choice. The Delray Beach Open by VITACOST.com features a team-format for its 3-day ATP Champions Tour legends event. For more information, please visit www.ATPChampionsTour.com. About The City of Delray Beach: In the southeast corner of Palm Beach County on the Atlantic seashore, a Village by the Sea that began as an agricultural community in 1895 has become one of Florida’s most popular destinations for visitors, new families and seasonal residents. The City of Delray Beach encompasses slightly over 16 square miles with a permanent population of nearly 65,000 and growing. The City’s charm continues to garner national awards, including three in 2017: an “All-America City” award from the National Civic League for literacy strides (the city was also recognized in 1993 and 2001), a “Playful City USA” designation for providing 24 playgrounds for residents, and the recognition of Atlantic Ave as one of the “10 Great American Shopping Streets” by USA Today. In 2012 during the nationally televised “Best of the Road” special, Delray Beach was chosen by Rand McNally, USA Today and the Travel Channel as the “Most Fun Small Town” in America. In 2014, USA Today named it as one of the “Best Atlantic Beaches in Florida.” For more information, please visit www.MyDelrayBeach.com.